The Quarq Battery Cover is compatible wiFor DZero power meters and for legacy power meters manufactured after January 8, 2015 (Revision ADX onward). This accessory pack comes with a replacement battery cover and anodized metallic decals in black, red, blue, green, orange and gold. The battery cover is used on DZero power meters. It features refined threads, making it easier to screw and unscrew, and grippier knurling. 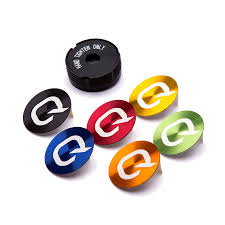 The colored decals are spun alloy with a laser-etched Q. Two of each color comes in the pack.